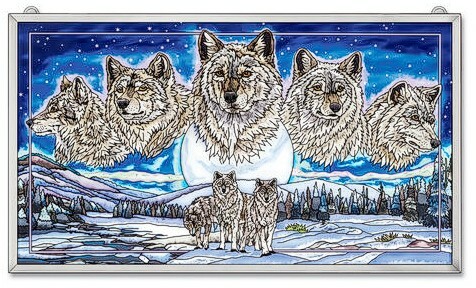 Moonlight Mystery Glass features the beautiful artwork of talented wildlife Artist, Al Agnew. The design is hand painted, you can actually feel it on the glass. The picture of this large metal framed glass does not do the piece justice. It is truly magnificent. Comes ready to hang. This would make the Wolf lover in your life very happy. Ships to you in a secure packing box framed by wood and foam. Each piece is slightly unique as it is hand painted. DO NOT USE SOLVENTS ON THE PAINTED SIDE. A lightly dampened cloth can be used to clean the painted side. A mild glass cleaner may be used on the unpainted side.